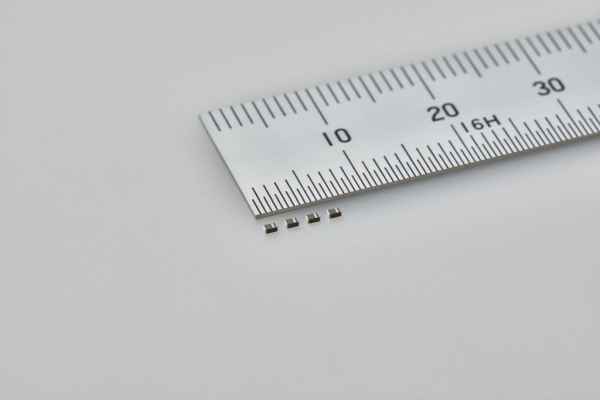 The expansion of the line-up of the metal multilayer chip power inductor MCOIL MC series, from TAIYO YUDEN, which uses a metallic magnetic material, as well as the commercialisation of the tiny metal power inductor MCEE1005 (1.0×0.5×0.55mm, maximum height), has been announced. This power inductor is used as a power choke coil in power supply circuits for wearable devices, smartphones, and IoT devices. By sophisticating material and multilayer techniques, TAIYO YUDEN has successfully commercialised the 1005-size metal power inductor, achieving a volume that is reportedly over 60% smaller than its conventional product, MCFK1608 (1.6×0.8×0.6mm), and will contribute to developing smaller and thinner mobile devices such as wearable devices. Production of the product started at the subsidiary company, WAKAYAMA TAIYO YUDEN in Japan’s Wakayama prefecture from September 2018 at a production rate of 10 million units per month. Today’s market for smartwatches, wristband-type wearable devices, and IoT devices like sensor network devices requires not only reduced size and thickness but also highly efficient power supply circuits for longer operating time. While smartphones are getting thinner, they use higher-speed processors for higher performance and multi-core processors for higher efficiency. Since high-speed multi-core processors, which are driven by lower voltage and larger current, use appropriate cores in accordance with processor load, each core is equipped with a dedicated power supply circuit, which requires small and thin power inductors with a large current capacity. To address this market need, TAIYO YUDEN has commercialised its metal multilayer chip power inductor MCOIL MC series, which uses a metallic magnetic material with high DC bias characteristics and has the advantage of being small and thin.